We all know that Dropbox has had some issues in the past with users accounts being hacked and data being stolen. This has worried a lot of Dropbox users and causing them to question if they should be using the free file storage service. As a solution to this problem, Dropbox introduced two-step verification like you find on Google. If enabled, when you sign in it will send you a text message or require you to use a authenticator application that will give you a code to enter as a second login item. Like Google’s two-step authentication you can use many different ways to authenticate yourself to Dropbox. Possibly the most popular way is to just receive a text message to your phone. You can also use Google’s authentication app available in the iPhone, Android, and BlackBerry app stores to generate your 6-digit authentication code. Now you may be asking, what if I don’t have my phone with me? There’s a solution to that as well, when you setup two-step verification you’ll receive a longer code that’ll be your backup code to save somewhere safe and go to when you don’t have your first method available. To use this method when signing in, click the “I lost my phone” button and you can use your backup code to sign-in. If you’ve gone a step further and lost your backup code, there’s still hope, you can go through the procedures to reset your password completely. Sign in to your Dropbox account. Click your name in the upper right hand corner. Scroll to the bottom and on the right hand side click the setup two-step verification button. 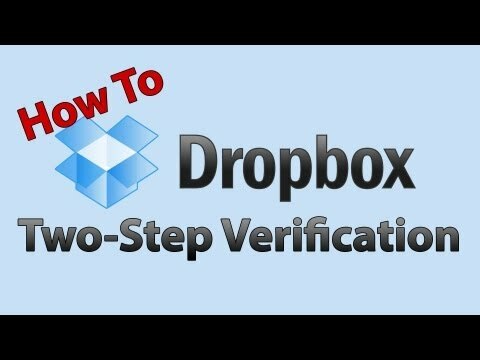 Follow the tutorial to set up and verify two-step verification. Using two-step verification gives you an extra layer of security between your account and hackers who are trying to gain access to your account to steal your information and potentially ruin your life. By putting that verification method in, even though a hacker might get your password, they’ll still need your phone to access your account. We here are LogicLounge recommend that for every account you make, to have a separate password and where available, activate two-step verification.